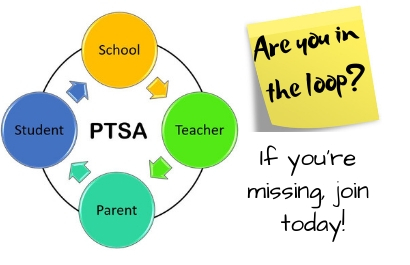 PTSO - Are you in the loop? AP Testing Schedule Click to see the dates for each AP test. 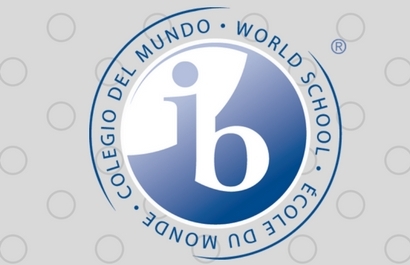 Dates are set by CollegeBoard. Senior shirts are now available to ALL seniors! They will be sold in Commons 1 in the mornings and at lunch on Y days only. Red tye dye for $15, Gray long sleeve for $15, and black hoodies are $25. Get all 3 for $50! See Mrs. Ellsworth in room 319 if you have any questions. Germanna Community College's GET Event Tuesday, April 23rd from 5-7! Members of Germanna's Enrollment team will be here to help students and their families with the application and admissions process! Get Enrolled! Get Help with Financial Aid! Get set-up to Register For Classes! Brooke Point High School Parent Teacher Student Organization (PTSO) Scholarship Application available on Scholarship webpage. Must be a member of the PTSO by Jan 31. Deadline to apply is April 24. 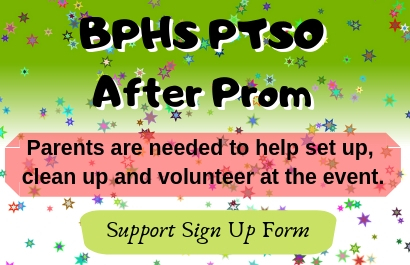 This is for BPHS students only and includes a 350-word essay based on the Motto "As One" about the specific changes or suggestions you would make in order to have a positive impact on the future of our school. Attention all students who are interested in attending a military academy: Saturday, April 27, 2019 is Academy Day! Senator Mark Warner invites you and your parents to Academy Day 2019. Attendees will be provided a comprehensive overview of the United States Service Academies and their admission processes. In addition, students will be able to meet with officials from all five academies and representatives from ROTC programs from Virginia Tech and Virginia Military Institute. Representatives from Virginia Congressional offices will also be available to answer questions regarding the application procedures for congressional nominations. For more details, come email Mr. Reynolds or stop by room 205 any time on Y days. Spirit Club meets after school in Ms. Seaman's room. French Club and National French Honor Society Remember to bring your $5 dues. Art Club will meet on Wednesday, in room 118 from 2:20 - 3:30 PM. Chess Club meeting Wednesdays after school in Mr. Wold's room. Environmental Club The environmental club will meet this Wednesday in room 334 right after school. Please have rides here by 3:00. Equality Club meets before school at 7:15 AM in Ms. Cover-Tucci's room each Wednesday morning. If matters of LGBTQ equality matter to you, Equality club is the place to be! FCA will meet Wednesdays from 2:30-3:30 p.m. in room 344. Anyone interested can attend. Fellowship of Christian Athletes The Fellowship of Christian Athletes will meet after school in rm. 344 on Wednesday to watch a movie till 3:00! All are welcome! Interact Club after school in room 305. The Interact club, sponsored by the North Stafford Rotary Club, is centered around community service and will offer members and volunteers multiple opportunities throughout the year to serve the local and global community. We are open to everyone and will hold afternoon and morning meetings to accommodate all. So please, give us a chance and let us help you get involved. Safe Space Club will meet in the library on Thursdays at 2:20PM. A place for teenagers to come together to give and get support and help in handling stress, anxiety, and other common issues facing teenagers today in a healthy way. Hope to see you there! The Spanish Club will meet in Mrs. Caley's room on Thursdays. See Mrs. Fair or Mrs. Caley with any questions. All juniors and seniors may attend up to 3 visits per year. There are 20 Colleges and Universities who have scheduled visits to come to BPHS. Please come to the Counseling office to sign up and receive a pass to attend. A list of visits is posted on the BPHS website under Counseling and also on the Counseling bulletin board next to the clinic. Interested Seniors: For an on-site admissions process, a student is visited by an admissions officer at Brooke Point High School for an interview. During the interview or shortly after, the admissions officer reviews the student's application and tells the student that same day if they are accepted. Behind the Wheel: Do you have your permit and ready to drive? Come by the Driver's Ed Room and get your application to sign up for behind the wheel. Here are the ParentVue Instructions. Parents are encouraged to use the ParentVue link (scroll up to the Students and Parents tab to find the link) to register for the parent portal. To register for the first time, parents must receive an activation key from counseling. Once registered, parents are able to view their child’s class schedule, courses, attendance, real-time grades, teacher classroom pages, and report cards. Teacher classroom pages are new this year, so be sure to check out the resources listed for each of your child's classes.